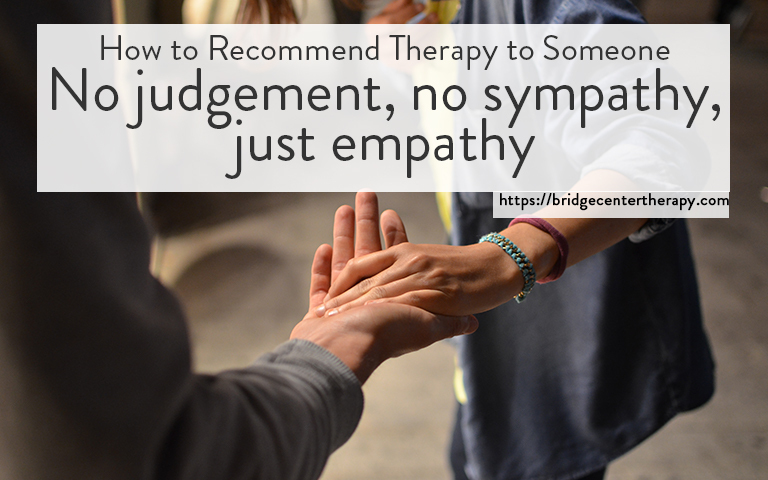 We can all benefit from therapy at one point in our lives. It is just part of the human condition. However, many of us are hesitant to seek therapy as the idea of cultivating a new relationship may cause anxiety. When you believe that a loved one may be in need of therapy, it can be a difficult subject to approach for fear of causing embarrassment. It is important to do it in an unobtrusive way that does not increase their anxiety and create avoidance. Here are 5 ways to help your loved one get the help they need. Respect the person’s privacy. Do not approach them and bring up the issue in front of other people. Bringing others in will make them feel like you are “ganging up on them”. They may end up pushing you away too. Do not corner your loved one. Find a time that is relaxed. Be compassionate and non-judgmental. Do not pity your loved one. That automatically places you in a superior position and will create shame. Recognize and verbalize that their feelings are normal. Tell them they deserve support. You can even choose to disclose your own experiences if you have benefitted from therapy. Emphasize that you are caring for them. Remind them that they matter to you. Sometimes people with mental health issues don’t believe that they deserve help. Show them that they are worthy. Make your loved one understand that you can see that they are going through something and that you want to help them get the help they need. There is still a stigma attached to getting mental health support. 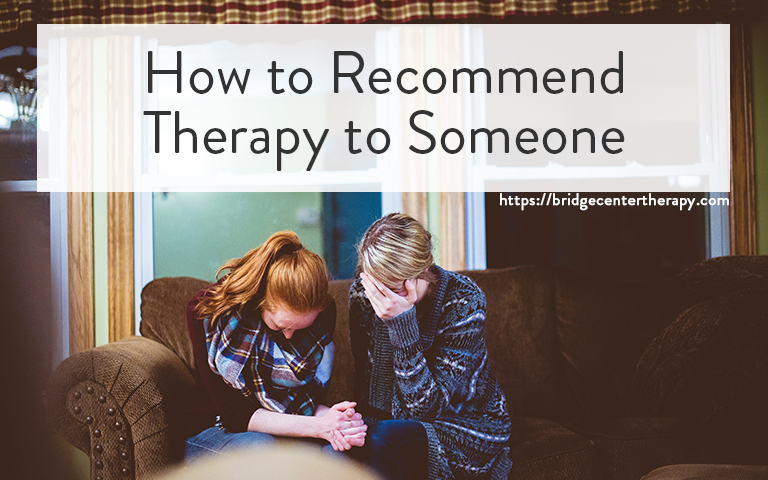 Your loved one may feel insulted when you suggest therapy. 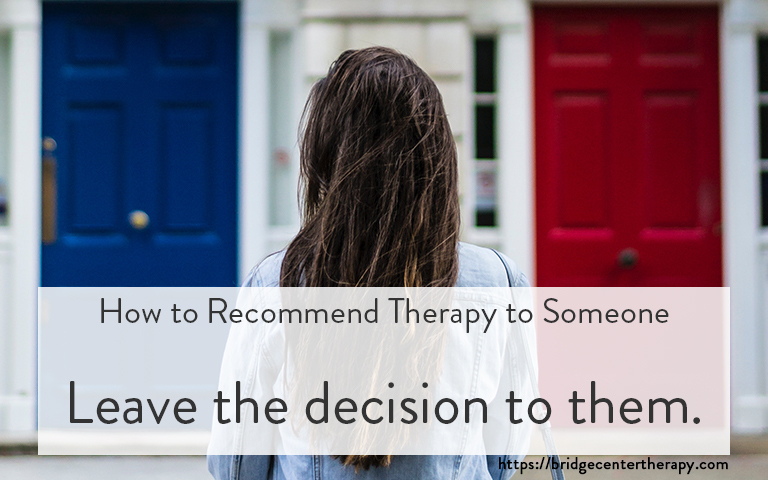 Do not take it personally if they get upset and be prepared to tell them why you approve of therapy. It is also a good idea to do your research and provide them with leads of good local therapy services. 5- Leave the decision to them. In the end, it’s not your choice and you can’t know how they will react for sure. The time might not be right and they may not be ready yet. The last thing you should do is to use force. If they are not there yet, continue to support them. Allow them to reach the decision on their own. If you have had this important conversation and you need help, we are here to help. Call (510) 497 4174 today.